In addition to the Independence Day holiday here in the United States, this weekend also marked the birthday of actress Margot Robbie. 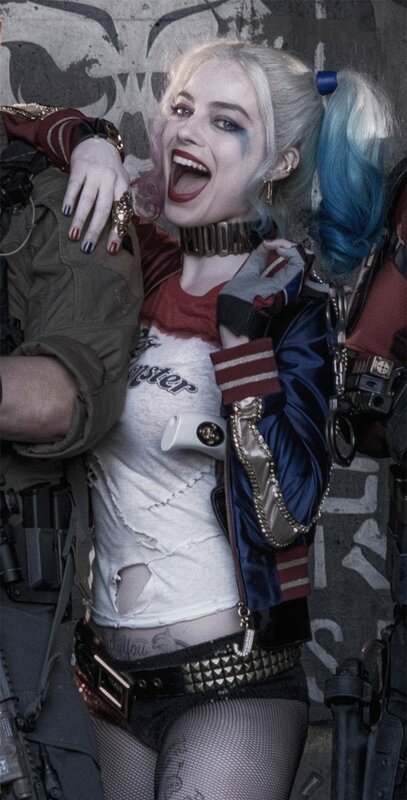 It turns out that this special day was celebrated on the set of David Ayer's Suicide Squad, and even had a cake personalized to her very special role in the movie: Harley Quinn. Harley's cake - thank you squad! Robbie herself posted this image to her personal Instagram page, not only giving us a look at a very cool and well-designed cake, but also her costume as the live-action Harley Quinn. It's a shame that the photo w was not taken from a wider angle, if not only because the pastry looks even more ornate than just what we see. The sides look like they are covered with sugar-formed iconography - including playing card-esque bands and Harley's name - in addition to the "comics" on top. Also, I'm hoping that those were trick candles, as that would have been quite fitting. At the very least, it's interesting to note that Margot Robbie is wearing the exact same costume in both images - and has been spotted wearing it in a lot of set photos. Either this means that the character isn't too big on hygiene and changing her clothes (honestly not entirely unbelievable), or that most of the events of Suicide Squad occur in a very limited timeframe. That makes sense given that the film will spend most of its runtime following the titular group as it executes a particular black ops mission (the goal of which has not yet been revealed). Suicide Squad has been filming up in Toronto for a couple months now, and it's unknown when the movie plans on hitting the finish line for production. It presumably only has at most a few weeks left, as the post-production process will surely take a good deal of time on a film of this size. The finished film - which stars Margot Robbie in addition to Jared Leto (The Joker) Adam Beach (Slipknot), Jai Courtney (Boomerang), Karen Fukuhara (Katana), Cara Delevingne (Enchantress), Joel Kinnaman (Rick Flag), Will Smith (Deadshot), Adawale Akinnuoye-Agbaje (Killer Croc), Jay Hernandez (El Diablo), Viola Davis (Amanda Waller), Common, and Scott Eastwood - will be in theaters on August 5th.